Each suite offers extra size king beds, very spacious and luxurious. Patio, private entrance, bath & walk-in shower & the bathroom of room 2 with atrium-garden. DSTV, Wi-Fi, mini-bar, tea tray, hair-dryer, shoe kit, air-con, international adaptors. Spacious, contemporary and truly a superior luxury experience, making these suites exceptional. Extra length queen beds. These 2 suites have its own private entrance as well as a balcony looking onto a full-view of the exquisite gardens. Full facilities. 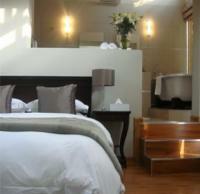 Very spacious, double volume, contemporary and truly a superior semi-selfcatering suite, making this suite exceptional. Extra length queen bed and has its own private entrance as well as a balcony looking onto a full-view of the exquisite gardens. Spacious, modern & luxurious living is key, whilst boasting a fully equipped kitchenette. It has its own private entrance opening onto 2 balconies with large sliding doors over-looking our beautiful gardens. Full facilities. If cancelling 7 days before arrival, forfeit 100% of the booking total. If cancelling 14 days before arrival, forfeit 75% of the booking total. If cancelling 21 days before arrival, forfeit 50% of the booking total. If cancelling 30 days before arrival, forfeit 25% of the booking total. Please note that The Leaves Guest House is a no smoking facility. All rooms are STRICTLY NO SMOKING. Should the no smoking policy of our establishment be ignored, penalties will be levied without consultation. For your convenience ashtrays are available on patios immediately outside each room..